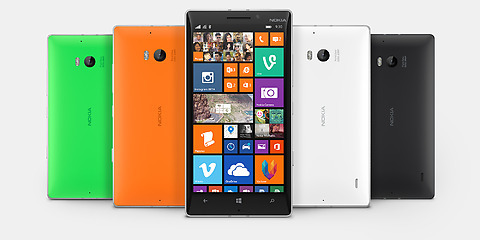 Originally unveiled last month, the Nokia Lumia 930 is being touted as the “The most complete Windows Phone to date. It’s the first to properly challenge the flagship might of Android and iOS with its impressive design, new Windows Phone 8.1 software and all round decent specs.” That’s a pretty bold statement considering its use of the Windows mobile operating system. But how exactly does Nokia’s latest flagship smartphone compare to Samsung’s Galaxy S5? The Galaxy S5 features a 5.1″ Super AMOLED display with 1080 x 1920 pixels, whereas the Nokia Lumia 930 is just a hair smaller at 5″ with the same 1080 x 1920 pixel resolution. The Nokia Lumia 930 does not have Super AMOLED technology, but rather basic AMOLED. There’s no denying the fact that Samsung’s Galaxy S5 is powered by one of the best mobile processors currently available. It features the Qualcomm Snapdragon 801 quad-core processor for superior speed and performance. The Nokia Lumia 930, on the other hand, is powered by the slower Snapdragon 800 quad-core processor. If you’re looking for a blazing-fast smartphone that’s capable of multitasking with half a dozen or more different applications, stick with the Galaxy S5. One of the areas where the Nokia Lumia 930 shines is its camera. It has an impressive 20-megapixel rear-facing camera with dual LEDs and 26 mm focal length. Granted, the Galaxy S5 has an incredibly powerful camera as well, but it’s not quite on par with the Nokia Lumia 930. The Galaxy S5 features a 16-megapixel rear-facing camera with just a single LED. Note: both the Nokia Lumia 930 and Samsung Galaxy S5 can record in the following formats: MPEG4, H.263, H.264, WMV. The Galaxy S5 and Nokia Lumia have 3 GB DDR3 RAM. The Galaxy S5 and Nokia Lumia have 32 GB storage space. With that said, the Galaxy S5 also supports the use of MicroSD, microSDHC, and microSDXC cards. If you happen to run out of space on the Galaxy S5, you can always install a memory card for additional storage. Featuring a 2800 mAh battery, the Galaxy S5 gets roughly 21 hours of talk time on a single charge. The Nokia Lumia 930’s 2420 mAh battery gets roughly half of this amount at just 11 hours of talk time. That’s a pretty significant difference, especially for people who are constantly on the go and away from power sources. Which smartphone do you prefer? Let us know in the comments section below!